I’ve been having a hard time finding the motivation to write lately. The thoughts in my head and the words on the page all seem the same as they have been for the past few months. The past few years. My son isn’t better. He’s still seizing. He’s still limited. He’s still heavily medicated. We’re still dealing with his school and trying to get him an education. Everything is harder than it should be. It feels like I’m walking through mud. Every step takes extra effort. Every step requires my full attention. I need to push my hands through the mud to search for my leg that is trapped in the muck. When I find it, I have to wrap my hands around it and pull it towards the surface. The mud resists, not wanting to let go. Even as my leg reaches the surface, the weight of the mud clinging to my legs and shoes threaten to pull it back down. It leaves me unbalanced. Even though it is only inches in front of where I started, I’m forced to push my foot back through the mud to the ground underneath. Even though I know it means that I will have to struggle for my next step, it’s the only way to find temporary stability. Otherwise, I risk falling over and being fully consumed. The struggle reveals itself everywhere. There are fewer right answers. There is more uncertainty. There is more acceptance of things that no parent of a 9-year old should have to accept. We’re in the same stressful, relentless situation watching our son struggle and seizure, but we have different perspectives and have different needs. We’re both trying to be there for our son but we go at different paces and we aren’t always within reach of one another. It’s hard to go to work after endless sleepless nights. It’s hard to concentrate on the work when the mind wants to worry about an upcoming surgery or the handful of seizures he had that morning. Friendship is harder because we’re so focused on the things we can’t afford to ignore that we ignore the relationships we need. Finances are harder because of the mounting costs of medical care, nanny care and tutoring. Diet and exercise are harder because we’re always so tired and pressed for time and it’s just easier to order something from the couch. But like many families in our situation, we continue to move forward. We keep taking labored steps towards a destination that we can’t see. Because where we are isn’t where we want to be. Because we hope we are heading in the right direction. Because there is no other choice. The mud is unforgiving, but in those moments of brief stability in between each step, I sometimes catch a glimpse of something wonderful. The struggle has given us gifts. I am a better parent to my son because I can’t take a moment for granted. I am a better partner and friend to my wife because we know what it is like to truly need and love another. And I have brought my whole self in to work and been surrounded by people who accept and care about me. We found understanding friends. And we have learned the value of trying to live the best life we can with what we have. It’s not always easy to see these gifts when I’m stuck in the mud. It’s difficult to be motivated when everything feels harder than it should be. But I’m doing my best to keep moving. I’m doing my best to learn and to grow and to be a good father, and husband, and friend. Because, really, there is no other choice. It was pitch black in the cabin as I laid in the bed next to my son. I was asleep but found myself instantly awake, alert and staring up towards the ceiling the ceiling. There was no movement and no sound, but I knew what was coming. The reason that I was awake was that my son started to have a seizure. That initial moment when my son’s body tightened was enough to pull me from my sleep. What came next was the rhythmic tensing of his muscles and the accompanying moaning as the air was expelled from his lungs and crossed his vocal chords. I turned to him the same way I always do and told him he was going to be ok. I rubbed his back and head until the seizure passed. Then I rearranged his body that had shifted during the seizure so that his head rested on the pillow so that he could return to sleep. Some nights, these seizures seem so routine that I can easily fall back to sleep, too. I switch on my autopilot and replay the same actions to comfort him and reposition him in bed. Once he is sleeping, my autopilot guides me safely back to my own dreams. The night in the cabin was not one of those nights. Instead, I laid in bed next to my son and felt a rush of sadness wash over me. In the four years that he has been having them, I have seen hundreds of seizures. Including subclinicals, he’s had thousands. Seizures and epilepsy are intertwined with every decision we make. We’ve been living with them so long that I thought it would get easier to see them. But it hasn’t. Each seizure brings me back to that first one. Those feelings of helplessness. They’re still there. During the day, it’s not seizures. It’s his struggling to find words. It’s his inability to remember what he did the day before. It’s him guessing at the right thing to say or do because his brain won’t make that connection for him. It’s him constantly saying sorry because his brain lets him down. It’s hard to not watch my son struggle and feel sad. As he stumbles over words to find the one he wants, it tears me up inside. I want to help him. I want to make it easier. I want to say the word for him so that he doesn’t struggle. But I know that he needs to find it himself. He needs to practice. So I smile and wait for him to find that word and try not to let my face betray the emotions I feel inside. Things are supposed to get easier the more you do them. Things are supposed to get easier the more you are exposed to them. We’re four years in but, while we have grown and are better capable of handling the mechanical motions of dealing with seizures, it still breaks my heart. 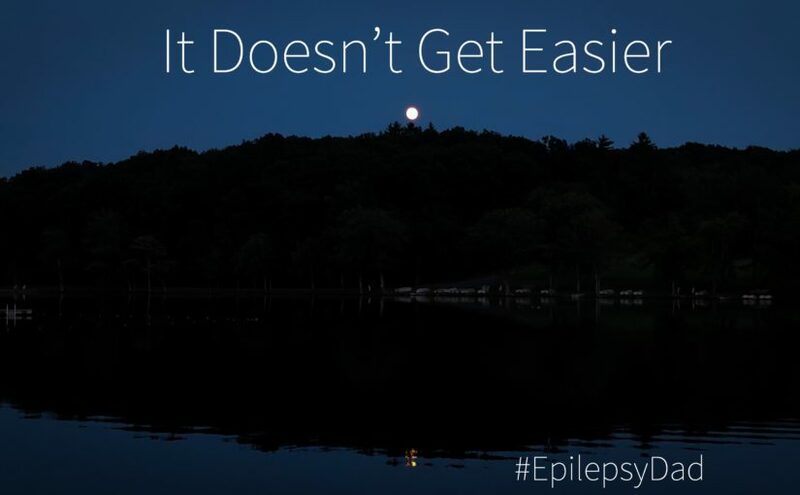 Every day we are faced with the reality of what epilepsy is taking from my son. 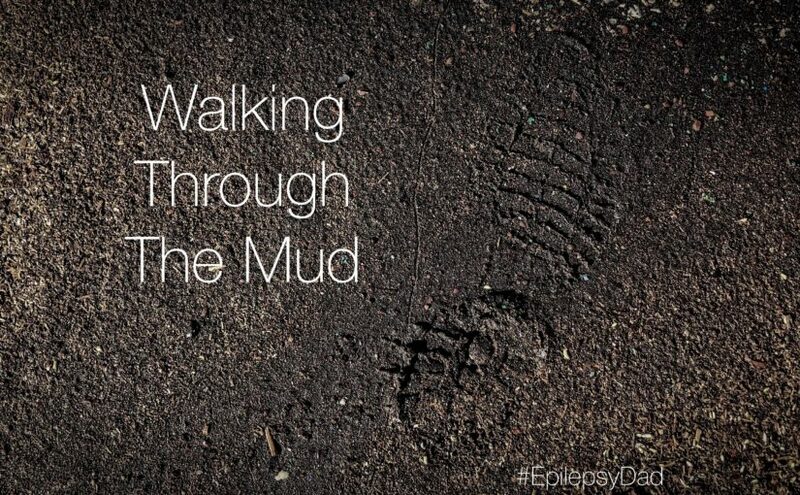 Every day, we see seizures and the physical, cognitive, and emotional toll that epilepsy is taking on him. And every day ends knowing that we’re going to go through it again the next day. It doesn’t get easier. Not really.